We Live in Public is a 2009 documentary film by Ondi Timoner, which profiles Internet pioneer Josh Harris. Its theme is the loss of privacy in the Internet age. The film details the experiences of "the greatest Internet pioneer you've never heard of," Josh Harris. The dot-com millionaire founded Pseudo.com, the first Internet television network during the infamous tech boom of the late '90s. After achieving prominence amongst the Silicon Valley set, Harris became interested in controversial human experiments which tested the effects of media and technology on the development of personal identity. Ondi Timoner documented the major business-related moments of Harris' life for more than a decade, setting the tone for her documentary of the virtual world and its supposed control of human lives. Among Harris' experiments touched on in the film is the art project "Quiet: We Live in Public," an Orwellian, Big Brother concept developed in the late '90s which placed more than 100 artists in a human terrarium under New York City, with myriad webcams following and capturing every move the artists made. The pièce de résistance was a Japanese-style capsule hotel outfitted with cameras in every pod, and screens that allowed each occupant to monitor the other pods installed in the basement by artist Jeff Gompertz. The film's website describes how, "With Quiet, Harris proved how, in the not-so-distant future of life online, we will willingly trade our privacy for the connection and recognition we all deeply desire. Through his experiments, including another six-month stint living under 24-hour live surveillance online which led him to mental collapse, he demonstrated the price we will all pay for living in public." "He climbs into the TV set and he becomes the rat in his own experiment at this point, and the results don't turn out very well for him," says Timoner of the six-month period Harris broadcast live, online his life in his NYC loft. "He really takes the only relationship that he's ever had that was close and intimate and beaches it on 30 motion-controlled surveillance cameras and 66 invasive microphones. I mean his girlfriend who signed on to it thinking it would be fun and cool, and that they were living a fast and crazy Internet life, she ended up leaving him. She just couldn't be intimate in public. And I think that's an important lesson; the Internet, as wonderful as it is, is not an intimate medium. It's just not. If you want to keep something intimate and if you want to keep something sacred, you probably shouldn't post it." The film includes commentary from Internet personalities Chris DeWolfe, Jason Calacanis, Douglas Rushkoff, and venture capitalist Fred Wilson, as well as artists and producers involved in the "Quiet: We Live in Public" event V. Owen Bush, Jeff Gompertz, Leo Fernekes, Feedbuck, Leo Koenig, Gabriella Latessa, Alex Arcadia, Zeroboy, Alfredo Martinez, and others. We Live in Public was screened six times at the 2009 Sundance Film Festival before being awarded the Grand Jury Prize award in the U.S. documentary category. Timoner is the first director in the Sundance Film Festival's history to win the Grand Jury Prize award twice. Her first win was for the widely acclaimed documentary, DIG! (2004). We Live In Public was also the runner-up for Best Documentary at the 2009 Karlovy Vary International Film Festival. On Rotten Tomatoes, the film has an 81% approval rating, based on 48 reviews. The critics consensus says, "This documentary about Josh Harris' surveillance-as-art project exposes the problems of privacy in the internet age and asks provocative questions about the power of ego in a place where everything is on display." Roger Ebert gave the film four stars, his highest rating, and wrote, "This is a remarkable film about a strange and prophetic man." 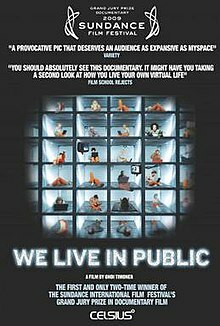 ^ "We Live in Public (2009) - Box Office Mojo". ^ a b c "We Live in Public | Home". Weliveinpublicthemovie.com. 2009-07-30. Retrieved 2009-10-20. ^ Wallace, Lewis (2009-01-13). "We Live in Public Tracks Net Spycam Madness | Underwire | Wired.com". Blog.wired.com. Retrieved 2009-10-20. ^ "Wired 8.11: Steaming Video". Wired.com. 2009-01-04. Retrieved 2009-10-20. ^ Nicole Powers (25 Feb 2010). "Ondi Timoner: We Live In Public". SuicideGirls.com. Retrieved 2010-02-25. .
^ "We Live In Public". Sundance Film Festivsl. 2009. ^ "All these wonderful things: Sundance 2009: WE LIVE IN PUBLIC, ROUGH AUNTIES Take Jury Prizes; Ondi Timoner Makes History as Women Filmmakers Sweep Top Awards". Edendale.typepad.com. 2009-01-25. Retrieved 2009-10-20. This page was last edited on 24 June 2018, at 19:56 (UTC).